I was excited. After months of not running at all, I could finally schedule a 3-to-5-mile run every other day and not feel the wear and tear on my feet. It took three months of rehab running to get there, and I was ecstatic at being able to add a new state to my running map. I was visiting a friend in New Jersey and she didn’t run. Her husband wasn’t much of a runner, but Peppy (short for Giuseppe) could run a couple miles on the treadmill, so he decided to give it a go with me out on the town and do a 4-mile run. Two miles out, two miles back. Easy peasy. We kept to the sidewalk because we were running on the main street in their smallish town, incidentally one town over from the Real Housewives of New Jersey—a detail that should have been an obvious foreshadow to the drama ahead of us. The sidewalks were narrow and often my running mate and I had to scrunch up together or go single-file to make it past overgrown bushes or the occasional oddly protruding fire hydrant antenna. A little over a mile in, we passed the place we’d gone for dinner my first night there. We headed into a slight downhill as we passed the Post Office around the 1.5 mile point, picking up the pace. Then at 1.66 there was a crack in the sidewalk. Actually, a giant chunk of sidewalk missing. I was into my stride and adjusted slightly to the left so I could step down onto the grass and avoid the jagged sidewalk edge. I didn’t adjust enough. As I stepped down trying to avoid the sidewalk, my right foot caught the edge and twisted painfully on its side. I went down in a heap, using both my hands to break my fall. In my left hand was my iPhone (I don’t run without music, even with company). 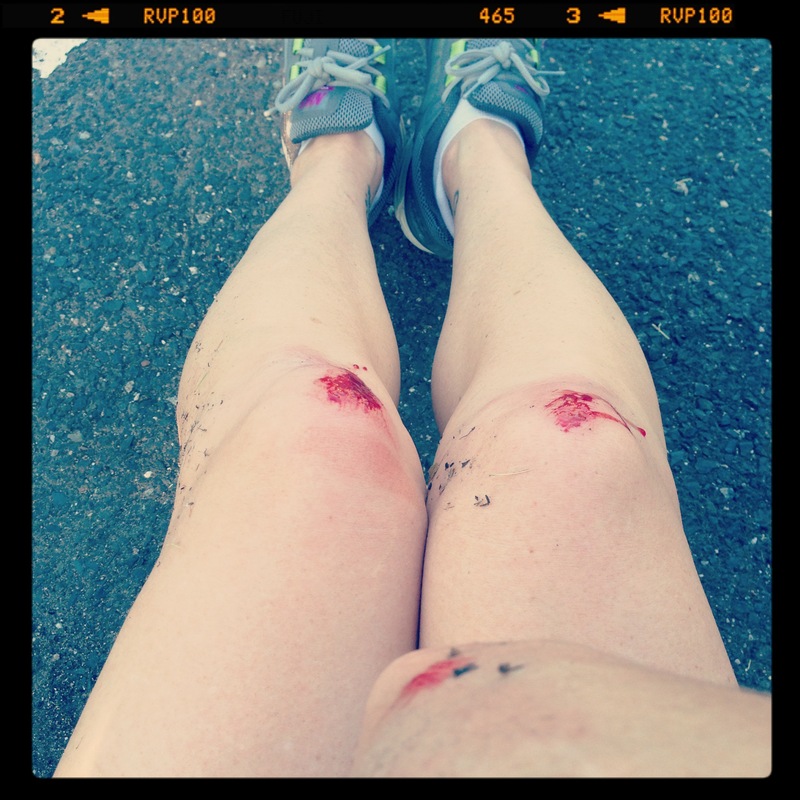 My knees hit the concrete first, then my left hand—and phone, glass first—then my right elbow, until my entire body had tumbled to the ground. Peppy ran back to the house for the car and came back to pick me up. I sat on the corner waiting for him, blood dripping from both knees and grass stains on just about every limb. A woman walking to the Post Office stared at me from across the street and yelled out, “Are you okay?” We had a brief exchange wherein I promised her I was okay and didn’t need her to call the police. Minutes later I was back at the house getting cleaned up and the rest of my day was off and running. Or sitting, as it were. Peppy went to the store and got me an ankle wrap—an adult sized ice wrap (as opposed to the kiddie-sized “boo-boo-band” in the freezer)—and a cane. When I was seven years old I fell out of my father’s truck as he made a left turn. He ran over my foot. I had a couple of broken toes and got to wear a cast and use crutches (crazy what kids think is cool, isn’t it?) for six weeks. 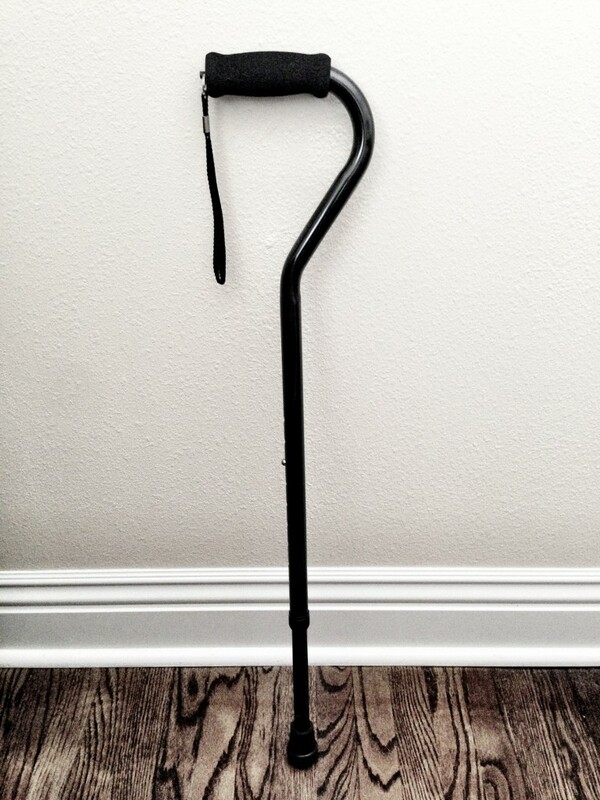 A cane feels far less cool than crutches, no matter what age I am. I tend to move through life in a rush. I want to get from here to there, and quickly. I use meditation to combat this reality, but there it is, just the same. Meditation is effective during said meditation, and I find the effects wear off throughout the day. If meditation is a favorite, calming teacher, my cane is a drill sergeant. Everything happens for a reason; I know this. Well, everything happens, and then we find meaning in what we do. We do if we’re going to learn and grow, anyway. So I ask myself what I ask my clients: What’s the learning here? The learning is that slowing down has something to offer me; it’s time to be on the lookout for what that offering is. The learning is that I don’t like not being able to do things for myself; it makes me feel lazy, even when I am physically incapable of carrying the laundry basket down the hall. The learning is that when it’s difficult to ask for help, that’s when I need it the most. The learning is that there is more learning on the way, and I don’t really know what that learning is. In addition to the little snippets of learning that reveal themselves, I am also in the uncomfortable space I need to move through in order to get to the deeper learning. I need to sit and do the work, then I can reflect back on what I’ve learned. ouch, sugar. big, major ouch. though i don’t love what happened to you and your phone, i do love how you call the cane your drill sergeant – that makes me smile. also love how you point out that we look for meaning post-event. that seems cleaner, clearer to me. hope you’re on the mend by now. i’m still cringing, though. This cane could lead an army through war, I’m sure of it!